and sensors to operate as a complete water leak detection system. 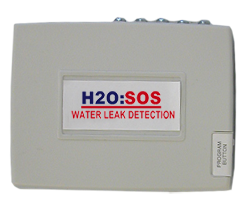 The H2O SOS Standard (Single Channel) Wireless Receiver is an integral part of a wireless leak detection system. Up to 32 transmitters can be programmed into the wireless receiver, providing adequate coverage for even the largest of homes or businesses. The receiver is wired directly to the control panel and should be mounted away from potential sources of interference such as motors, fans, and other electrical devices. If you are installing two or more receivers it is recommended that they be installed a minimum of 6 feet apart to prevent interference. The receiver has a range of 700 - 1000ft in free air, with a more limited range when the signal must pass through walls or other barriers.